It isn’t hard to spend ten perfect days in SLO CAL, with its year-round sun, warm Mediterranean marine climate, world-class wine region and thousands of acres of protected open space. But when Festival Mozaic comes to town, all of SLO CAL becomes the stage, with 50 top classical musicians gathering to make music together, share in our culinary bounty and, of course, enjoy a glass or two of wine. For 47 years, Festival Mozaic has been providing world-class music experiences in spectacular spaces for visitors to SLO CAL. 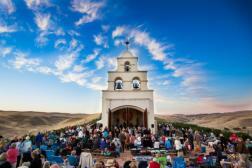 Enjoy musical concerts in amazing spots like the Mission San Luis Obispo de Tolosa, Serra Chapel high on a hill in wine country, an old adobe amid gorgeous gardens and the state-of-the-art Cuesta College Cultural and Performing Arts Center. 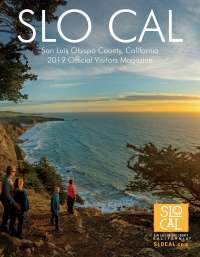 You’ll see our musicians everywhere in SLO CAL, from July 19-30, at wineries, churches, private homes and concert halls. If you see someone with an instrument case, chances are they’re in town for the Festival! Ask them how playing at Carnegie Hall compares to playing in the vines at Chapel Serra in Shandon. They’ll be sure to tell you nothing can compare. Join musicians from the orchestra in an outdoor Benefit Dinner in the Plaza featuring farm-to-table delicacies from Big Sky Café and elegant German-style wines from Claiborne and Churchill, then follow the players inside the Mission San Luis Obispo de Tolosa to see Maestro Yoo conduct the Orchestra in a concert of Mozart and Beethoven. You can also crossover to the Fringe side with the bold sounds of string trio Simply Three, who play incendiary covers of pop music songs of today. With lights and video integrated in to their performance, Simply Three redefines what a classical music concert can be. It’s truly a show for all ages. On Saturday, July 22, be transported to a heavenly place with Baroque in the Vines in a venue like no other, Serra Chapel in Shandon. Sit outside this private chapel’s massive, open doors as Vivaldi’s timeless Four Seasons wafts over the vines from the orchestra inside. Arrive early for picnicking, tour the chapel’s interior and enjoy the views! Award-winning wine and farm-to-fork cuisine are both fueled by SLO CAL’s close proximity to California’s agricultural epicenter, and plays a big part in the Festival’s events. 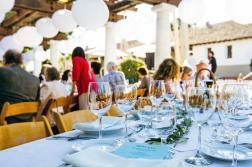 Mingle with other attendees as you sip wine from Kynsi Winery and enjoy the beautiful Wind Dance Farm lavender gardens, courtyards and dine poolside before hearing Beethoven in a Barn! In this hectic, fast-paced, plugged-in world, classical music performances gives us space to sit together, relax, and let timeless beauty wash over us. 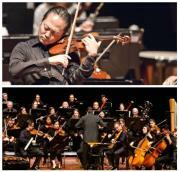 At Festival Mozaic, the best classical musicians in the United States come together in SLO CAL to make this music for the audience, and to enjoy each other’s company. No rushing allowed.